There is a widely held belief that a child reading a book series will be detrimental to the development of that child being a good reader. I see it all the time, especially in groups created for parents seeking to foster a love of learning in their children. Here it is people. The truth. 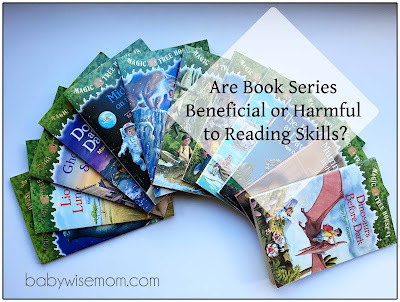 Reading a book series will not harm the reading skills of your child. Reading a book series is okay. Reading a book series can be beneficial to your child. Reading a book series can be the “gateway” reading experience that will hook your child on reading and make her a lifelong book lover. This post contains affiliate links. The history behind the “looking down the nose” at series books goes back to the 1860s. Around this time, dime novels were being published. These were marketed toward and appealed to the servant and labor class (gasp!). Soon to follow were the series novels, aimed at preteens and teens. Some of the series included in these early series are Nancy Drew and the Hardy Boys. Elitists were so against these series books that companies refused to print Nancy Drew index cards for the card catalog. They also blacklisted certain authors who wrote book series. Not only did these elitists believe series were bad, they also believed fiction was bad. Yes, fiction. “…fiction was something to be fed to children in only small, controlled doses” (page 146). The worst of the fiction was obviously the series books. An actual expert from a quote is “No dissipation can be worse than that induced by the perusal of exciting books of fiction…a species of monstrous and erroneous nature” (page 146). They believed a series was so much worse than fiction because it was addictive. Children wouldn’t just read one fiction book–they would read the entire series! And they would do it quickly and with great interest! They were indulging in these books of fiction, which were supposed to be only given in small doses. So there you have your foundational history as to why a book series was proclaimed to be the worst of the fiction books. But in my mind, the very reason the elitists abhorred series books–the fact that they result in children reading more fiction overall–is the very reason to applaud the series books! These books result in children reading more books. There is an old adage that “the more you read, the better you get at it.” Series books lead to reading more. One powerful example is the Harry Potter series. It is marvel to see children willingly picking up a book as thick as any in the series. In 1926, the American Library Association surveyed nearly 40,000 students. They found that the favorite book of 98% of students was a book series. They also found “…the high-IQ students reading twice as many of the series books.” (page 147). Rules about skimming and inferring. When to slow down to decipher clues. The importance of chapter titles. The importance of characters and setting. So do not feel like you are damaging your child’s academic future by allowing series books to be read. Reading a second, third, etc. book in a series is like chatting with an old friend from high school. You know each other well and are comfortable with each other. While you might not make any huge cultural revelations or learn a ton of new things, you can still learn great life lessons. Sometimes those old and dear friends surprise you. You have a history with this friend and therefore you are invested into the future of this friend. You will contact the friend later to see what the life update is. The same is true for a book series. While I love a book series and do not have a problem with my children reading them at all (in fact, I strongly encourage them because I know what a good book series will do for a love of learning), that isn’t to say there aren’t some limitations with a book series. A book series that is written by one author will only expose your child to a certain number of vocabulary words. You child will gain greater exposure to a rich vocabulary if he branches out and reads books by various authors. This doesn’t mean a book series has to be out. It just means read more than one series in life. Another weakness is that your child will not need to work hard to get to know a new style of writing, new characters, or new plot if he sticks to just one series. A book series can also be a major security blanket. Your child might feel hesitant to move beyond the series. Now, some series are short, but many series for children have 50-100 books. Those are the ones you will need to draw your child from and encourage your child read something different. So yes to a series, but do encourage a variety of series. I actually had to require my oldest read something other than Magic Tree House initially. He was hesitant to read anything else as a first grader. He found what he liked and he was sticking with it. Once he read something different, however, he gained confident that he could handle other books. Magic Tree House: This is my favorite series for a good “gateway” book series to get kids hooked on reading. It appeals to boys and girls with the two main characters being a boy and a girl. They are exciting, which keeps kids interested in turning the pages. They let kids see that reading isn’t so hard and they can do it! Let me end with some anecdotal evidence. In my youth, I loved reading. Most of the time, I read series books. My personal favorite series of all time was the Baby-Sitter’s Club. I typically read through about 50 chapter books a month in my later elementary years. Not a typo, and yes, I had other hobbies. I have since gone on to get a Bachelor’s degree in English. I was even named Most Outstanding Graduate. I am still an avid reader today, and I still enjoy a good series! Brayden, my oldest, is 10. He also reads series books often–in fact, I think it is safe to say that of the books he chooses to read, 99% of them are book series. He has been identified as gifted and as an 8 year old, he was tested as having a college reading level. Kaitlyn, age 8, has also been identified as gifted. She completes at least one book every day. She reads many series books, though her personal percentage is probably more like 85% of the books she chooses on her own are book series. My other children are too young to have strong evidence to share. Follow Valerie’s board Chapter Books for Boys on Pinterest. Follow Valerie’s board Chapter Books for Girls on Pinterest. Visit Babywise Friendly Blog Network.’s profile on Pinterest.